Large lecture halls can be an excellent place to hide. If you sit far back enough, it’s easy to lose focus. However, if you’re looking to get the most out of your college experience here are a few suggestions in order to get the grade you want. 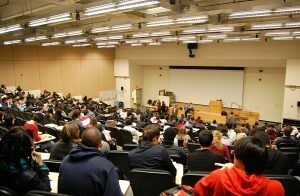 The most obvious tip for focus in class is to sit near the front. Don’t worry, I’m not suggesting the first two rows, but 5-10 work just as well. By being closer to the professor, you’ll be able to hear better. Not to mention, it’s harder to hide a phone when you’re so close. The previous tip tied into this one: no phones. It may seem obvious, but it’s easy to forget. As the semester continues, your focus is easier to pull away from the lesson. Have a designated spot in your backpack for your phone and consider putting it on “Do Not Disturb” mode before class begins. This last tip isn’t as obvious, and it can be especially helpful for those early-morning classes. Bring gum. If you’re having a hard time staying awake, the simple motion of chewing gum will keep your body moving, even if only a little bit. Plus, it’s much less annoying to your peers than clicking a pen or bouncing your leg.